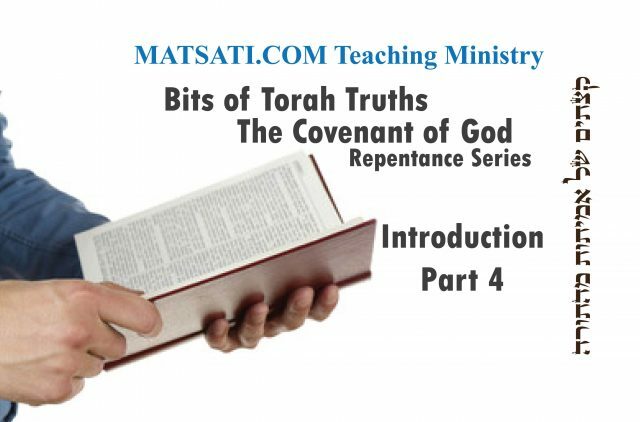 Bits of Torah Truths, The Covenant – Repentance Series, Introduction Part 4, Is the Torah still Binding? Studying the Scriptures in both the English and the Hebrew languages, the major premise that tends to come forth (from the Hebrew Scriptures) based upon the teachings in the Tanach and the Apostolic Writings is that the Torah is still binding and that Hashem, did not intend for Yeshua’s appearance to render irrelevant the message of the Torah but is in fact a part of the message of the gospel which is to walk in righteousness, holiness, justice, and truth, and to seek the Lord God of Israel all the days of our lives. These instructions do remain valid for us today taking the peshat (simple) reading of the biblical texts in contrast to what modern theologies teach. Modern theologies would have us believe the Apostolic Writings supersede the Torah. The Apostolic Writings however are in fact a first century commentary on the Torah as a way of life. The majority of Christian denominations however subscribe to some version of replacement theology, that the church has replaced Israel, and that the New Covenant has replaced the Old. Today we live in information overload, where there is unprecedented access to the Rabbinic texts, and to ideas which for the modern church goer are foreign. This explosion of information and accessibility to information has helped to facilitate this Jewish mode of appropriation and application of the Scriptures in our lives. Take for example, some 30 years ago, a non-Jewish non-academic student learning Talmud would have been difficult to fathom. Today however we find many followers learning about the weekly Torah portion from popular Web portals such as aish.com and chabad.org. For some believers who are trying to connect to the God of Israel and to Yeshua the Messiah, the answer is to live like a Jew. This approach comes as a consequence of studying God’s Word and taking seriously the 5 books of Moshe and considering the following questions. “How does the church understand the application of Torah today?” Note how in Part 3 we looked at this in relation to the parallel to the pagan nations. Additional questions we can ask are, “Was the Torah something temporary until the coming of the Messiah Yeshua?” And “Why are these Scriptures not applicable today?” An example may be found in the book of Devarim / Deuteronomy 12:28? Modern translations are discordant on these questions. For example, Galatians 3:24 appears to state contradictory interpretations on the Greek text according to Paul while examining the various English translations New Living Translation (NLT) and the NIV as compared to the NASB. Looking at these translations illustrates the significance on how important it is in choosing an English translation, because modern theology has deeply effected the biblical translators. The the NLT translation states that the law “was” our guardian “until” Christ came speaking of something that has passed. The NIV also states this in a similar way. The NASB however states the Law “has become” a tutor to lead us to Christ, so that we may be justified by faith. Note how according to the NASB the Torah is a means for guidance in righteous living, and for directing us to the Messiah and is to be lived out by faith. This leads us to conclude that the choice of translation of the bible has serious implications for our understanding the Scriptures in relation to our understanding on the application of Torah for our lives. The Messiah Yeshua opened up access to the Torah as it is to be performed by faith and not out of route to earn merit of our own accord. In regard to the validity of Torah for our lives today, take for example the following statements from the book of Deuteronomy. This is the significance of the Torah, to keep us on the straight and narrow path, and to test what people say whether it is from the Lord God of Israel or not. Might this had been what happened when the early church left the study of the Torah and believed only in the signs and wonders of the God of Israel because of the power of the Name of Yeshua? Note in Matthew 7, Yeshua speaks of the power of the Name in the midst of a people who thought they were saved but in the end were workers of iniquity. Did the church’s leaving the understanding of Scripture from a Torah perspective the natural by-product of the rabid anti-Semitism we see in history and even today? If we do not take a Torah perspective that was established from the beginning, an Israel centric understanding of Salvation that is brought by the God of Israel to all the nations of the earth (Isaiah 2), then what we find is the gradual development of replacement theology which leads to the natural conclusion of anti-Semitism! The writer argued that “only the Christian could make sense of the Bible.” The “carnal Jews,” with their “earthly mind-set,” had failed to recognize the hidden message of their own Scriptures, and as a result, had eternally forfeited their entitlement to the covenant promises made to Abraham, Isaac and Jacob. I have endeavored to show that the Jews…departed from God and lost God’s favor… while the Christians succeeded to their place, deserving well of the Lord by faith, and coming out of all nations and from the whole world. We Christians when we pray, say “Our Father” because He has begun to be ours, and has ceased to be the Father of the Jews, who have forsaken Him. Based upon these few sources, the anger and hatred of the Jewish rejection of Yeshua has led to a great animosity against the Torah and obedience to the commands. As a result of centuries of believing the Jews have departed from God and His favor, we find today a modern theology that has impacted the minds of many believers, such as the doctrine of Dispensationalism. If you take an objective view of the doctrine of dispensationalism and speak to many people concerning this doctrine, based upon my past experience, the consequences of a dispensationalist view may be summarized in the following way. The faith of men previous to Yeshua was some how deficient. Here again as we find in the English translations of the Scriptures, there is a discordance amongst denominations on the interpretations of dispensationalism. Dispensationalism is a religious interpretive system for the Bible. It considers Biblical history as divided deliberately by God into defined periods or ages to each of which God has allotted distinctive administrative principles. According to dispensationalist interpretation, each age of the plan of God is therefore administered in a certain way, and humanity is held responsible as a steward during each particular time frame he finds himself living in. Throughout Scripture, God revealed Himself and His truth to humanity in a different ways. Humanity is therefore held responsible to conform to that revelation. If humanity rebels and fails the test, the Lord God judges humanity and introduces a new period of probation under a new administration. Note the inherent “works based” interpretation on the consequences of God’s judgment on mankind which leads to the “faith alone” theology. One of the most important underlying theological concepts for dispensationalism is the idea of progressive revelation. While some non-dispensationalists start with progressive revelation in the New Testament and refer this revelation back into the Old Testament, dispensationalists begin with progressive revelation in the Old Testament and read forward in a historical sense. The most significant aspect of dispensationalist doctrine is that the Biblical covenants are associated with the dispensations under which the Biblical covenants are compared and contrasted. In addition to the comparison and contrast of the Biblical covenants, the promises of God that are found within the covenants, dispensationalism places a particular emphasis upon to whom these promises were written. This has resulted in certain fundamental dispensational beliefs, such as making a distinction between Israel and the Church, and causing the Torah to be irrelevant for the believer today. All dispensationalists profess a definite distinction between Israel and the Church. For dispensationalists, Israel is an ethnic nation consisting of Hebrews (Israelites), beginning with Abraham and continuing in existence to the present, and is not a part of the Gentile church. Dispensationalists do not understand the Gentile church as being grafted into Israel per Paul’s words in Romans 11. Dispensationalists also believe the Church consists of all saved individuals in this “present dispensation” of which started at the “birth of the Church” in Acts (Pentacost), this is a topic we discussed at length in Part 1 of this series in ration to the “birth of the church” theology. Dispensationalism teaches a distinction between Israel and the Church but this is not always mutually exclusive, in the sense that there is a recognized overlap between the two in relation to “Jewish Christians,” those who are ethnically Jewish and also have faith in Yeshua the Messiah, but these Jews must also have left (turned their backs upon) the Torah and Judaism. Classical dispensationalists refer to the present day Church as a “parenthesis” or temporary interlude in the progression of Israel’s prophetic history and so this theology introduces something distinctly different based upon the history of the Bible that is not Israel centric. Progressive dispensationalism on the other hand “softens” the Church-Israel distinction by seeing some Old Testament promises as expanded by the New Testament to include the Church. However, progressives never view this expansion as replacing promises to its original audience, Israel. Another consequence of the thousands of years of anti-Torah theology have resulted in Covenant Theology. Covenant Theology is the alternative opinion to dispensationalism which presupposes that God has one people Israel and the promises to Israel made in the Old Testament were fulfilled by Jesus Christ, the new Israel, where the Church is the “New Israel” and has become the new object of Abraham’s hope. Dispensationalists criticize Covenant Theology as being identical with what they term “Replacement Theology” or Supersessionism, the concept that the Church has replaced Israel. However, in Covenant Theology, the church is not a replacement for the nation of Israel, the church is known as the “spiritual Israel.” Many dispensationalists also hold to this interpretation, and this comes out of modern theologies as “we are Israel now,” or “we are Jerusalem.” If you hear a preacher teaching that he is teaching a theology and not a biblical truth. Covenant Theologians distinguish between Israel of the flesh (ethnic Hebrews) and Israel of the Spirit (the universal Church), which began with Adam and Eve and matured largely within ethnic Israel. Jewish Christians are included in this spiritual Israel and they must have had “converted” which is understood as having left Torah and Judaism. Covenant Theologians on the other hand also accuse Dispensationalism of replacement theology. The position of Covenant Theology on the relationship of the physical and spiritual Israel have classically used Romans 2:28-29 as a proof text, however, this is not necessarily a correct interpretation on Romans 2, as we discussed in Part 2, that at the heart of every gentile believer should be the heart of a Torah observant Jew. Dispensationalism rejects the notion of supersessionism, and still considers the Jewish people as God’s chosen people, and sees the modern State of Israel as resulting in the Israel who will receive the fulfillment of all God’s Old Testament promises, eventually, one day in the future, etc. While studying the book of Romans, the central theme discussed at length in Romans 9-11, which has been ignored throughout most of Church history, is that in these last days, God is raising up thoughtful, Spirit-directed Gentiles who are heeding the call of God and His desire for Gentiles to reach out to Jewish people with Love and Power from a Torah based perspective. Gentiles from other nations who have embraced the present Torah movement by the calling of God’s Spirit are also passionate about Jewish things, such as the Jewish Roots of our faith in Yeshua, and reaching out to Jewish people with the Gospel message. Midrash Tehillim 100, Part 1 continues saying, “Thus, also in the verse The voice of joy and the voice of gladness, the voice of the bridegroom and the voice of the bride, the voice of them that will say, Give thanks to the Lord of hosts, for the Lord is good, for His mercy endures forever, and of them that will bring offerings of thanksgiving into the house of the Lord (Jeremiah 33:11), Give thanks to the Lord is an enjoining of prayers of thanksgiving; while them that will bring offerings of thanksgiving is an enjoining of thank offerings.” The basic premise is that within the context of God’s powerful work in our life, we are able to give praise to Him and His ways, we bear the testimony of God in our lives His enabling power to be free from sin, and our sacrifice is in the manner in which we live our lives. We live our lives according to His will, and not according to our own will. The application of the Torah for our lives is summarized by Sforno according to his commentary on Bereshit / Genesis 49:1 Part 1. בְּאַחֲרִית הַיָּמִים, at the end of the period allocated to life on earth as we know it. Yaakov speaks of the arrival of the Messiah which will signify the end of the existence of the nations that oppose G’d and the Kingdom of G’d on earth. At that time the measure of sin that these nations accumulate will be full to overflowing, so that G’d will feel at liberty to bring about the appropriate retribution. [the concept is as old as Avraham, to whom G’d explained that realization of his offspring disinheriting the Canaanites will have to await the time when the measure of sin of these people will be full. (Genesis 15:16). Ed.] Our author, drawing on various prophecies of the Books of Prophets to support his interpretation of באחרית הימים, “the end of days,” quotes Jeremiah 46:28 “for I will make an end to all the nations among which I have banished you; but I will not make an end of you!” He also quotes Bileam’s prophecy in Numbers 24:14 detailed in verse 17, in which he prophesies the doom befalling all the nations pre-eminent in his time and describes Israel as triumphant at that time. He adds that his prophecy is not one the fulfillment of which is imminent, but that much time will elapse before it will be realised. Similar prophecies are not only found in Michah 4,1 but even in our chapter when blessing Yehudah in verse 10, Yaakov speaks of the time frame he has in mind as the one when Shiloh will arrive, the one to whom nations will pay homage. Sforno states that in the end times, his reference to the end times is to that of the arrival of the Messiah, will bring the end of the existence of the nations. This interpretation inherently speaks of being joined with Israel in the sense that the nations are those who are “other” than Israel. The measure of the sin of the nations will be overflowing, and the Lord will bring retribution upon these ungodly peoples. (Look at the NT parallel in 2 Thessalonians 1) The point is that in this time period, only those who are left are those who had joined themselves with the Lord God of Israel and with His Messiah as Jeremiah 46:28 states “for I will make an end to all the nations among which I have banished you; but I will not make an end of you!” speaking of His people. Indeed the Lord is good and He is looking out for His people, and has a plan for His people from the beginning. The question is, do you want to be a part of that plan? If so, join yourself with Yeshua the Messiah and with the Lord God of Israel today! Previous articleTehillim / Psalms 99, ספר תהילים צט, Part 2, Crediting Righteousness to Yourself? Parashat Yitro, Seeking and Listening to Wise Counsel.